Home » WordPress » Astra vs GeneratePress vs Schema: Which theme is most suitable for your blog? To run a blog successfully, you need to look beyond writing and publishing content. There are many other factors, such as blog’s design, loading time, mobile responsiveness, search engine friendliness, etc. that Google takes into account while crawling a site and placing it in search results. Based on the overall score concerning these factors, some sites are ranked on the first page while others get disappeared over time. If you aspire to build a long-term successful online business, then pay close heed to them. There are two ways to forge ahead — you can either look into all these ranking factors manually one by one or install a perfectly coded WordPress theme that does the job for you. Make sure you go for the second option as it is less time consuming and far more sustainable as compared to writing codes manually. Given the number of themes available in the market, sometimes you may get confused as to which one to select and which one to leave out. To put an end to your confusion and help you make the right call, I have brought together and compared three of the highest selling and most popular WordPress themes in this post — Astra, GeneratePress, and Schema. 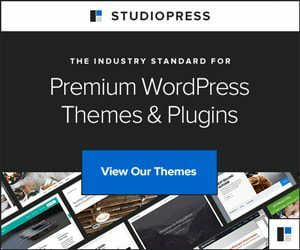 By the time you finish this review, you’ll know which theme is most suitable for your blog and has the potential to take it to greater heights. Astra is a free theme powered by minimal design and excellent loading speed. Link it with free Astra Sites plugin to design a beautiful website within a few clicks. Usually, the free version of Astra is good enough to get your desired results. However, if you wish to walk the extra mile and have a broad range of premium features at your disposal, then go for Astra Pro Add-on plugin and build a custom website within a few clicks. GeneratePress, on the other hand, is a lightweight WordPress theme that comes packed with premium extensions to give your site a classic touch. If you’re a developer wanting to revamp the overall appearance of your site with the help of page builders, then GeneratePress is the ideal theme to try out as it supports most builders available in the market. The Schema is one of the highest selling and most popular themes ever launched by MyThemeShop. If your goal is to have a theme that gives you not only world-class customization options but also a whole bunch of SEO friendly features to rank any site on the first page of Google, then look no further. MTS Schema is the perfect search engine friendly theme with built-in rich snippets and custom review system. Be ready to experience a stiff competition among all these themes when it comes to ease of use. Both Astra and GeneratePress make the best use of WordPress’ theme customizer feature. If you install either of these themes on your blog, you’ll see all the customization functions grouped together and perfectly organized in the theme customizer page. They come with a modular approach, which means that theme developers have put together all the related features as a single module. Based on your requirements, you can easily activate or deactivate these modules and customize your site accordingly. No need to make any change in HTML or CSS code to enhance visual appearance and functionality of your site. The Schema theme is not much different in terms of ease of use. All the customization features are clubbed together in such a way that anyone can use them without facing any trouble. As far as this point is concerned, Astra is ranked one, followed by Schema and GeneratePress. Given the decisive role that site load time plays in Google ranking these days, you cannot overlook the performance score of a theme. All three of these themes are considered the best in terms of performance. While the GeneratePress is a feature-rich theme that offers a lot of customization options, Astra keeps things simple on the back of its lightweight design. When used with Elementor template, Astra’s load time is comparatively lower than GeneratePress. However, when you remove Elementor from the equation, both get similar scores on Pingdom. Depending on which page builder you use, this score may vary. All in all, Astra is lighter than GeneratePress. Schema, on the other hand, faces no competition here. It’s claimed to be one of the fastest themes ever launched by MTS. So, performance wise, Schema gets top spot followed by Astra and GeneratePress. There are not many themes that can offer you better layout customization than Astra and GeneratePress. Astra is packed with add-ons such as page headers, header sections, etc. Inside the customizer folder, you get to experience some incredibly easy to use features to add a layout above & below the header, edit the primary header, and also give a transparent look to header bar. The GeneratePress, on the other hand, allows you to set unique headers for different pages. In addition to offering transparent page header option, it also allows you to add images, video background, content or put all these elements to use comfortably. Compared to both these themes, Schema is very simple, yet it provides a host of layout customization options according to your site niche. GeneratePress tops this list followed by Astra and Schema. Schema works excellent on regular blogs exploring tech, business, startups, healthcare, lifestyle, sports or entertainment niches that are needed to load fast and perform well on smartphones as well as tablets to rank high on search engines. However, if you’re interested in building micro-niche or affiliate sites that require heavy customization using different page builders for review posts, detailed content, etc., then go for Astra or GeneratePress. Both of them work well with most page builders like Beaver Builder, Elementor, and Thrive Architect. Elementor has recommended users to go with GeneratePress on its official site, which you cannot ignore. Same is the case with Thrive Architect as GeneratePress works smoothly with this builder and allows you to make critical changes in your site’s layout easily. If you’re more comfortable using Beaver Builder, then it’s better to opt for Astra than GeneratePress. That being said, if you’re inclined towards using Elementor or Thrive with Astra, you can do so easily. The only thing important here is that you should have a clear idea of what you want to do using these plugins. Both Astra and GeneratePress work equally well with Visual Composer. When it comes to ranking these three themes based on their compatibility with leading page builders, GeneratePress will grab the top spot while Astra will get the second rank followed by Schema. To curb the rising competition & limited growth opportunities, and increase revenue streams, you may want to start an online store side by side with your primary blog. It can be done easily by installing the WooCommerce plugin on your site, provided your theme has built-in support for it. Astra, GeneratePress, and Schema can easily be configured to set up an online store and start selling digital and physical goods to users from all over the world. Sometimes, you may find it tough to decide which of these themes will work better with WooCommerce. Here is how you can this doubt. Both GeneratePress and Astra are loaded with dedicated add-ons/modules for Woocommerce integration. As soon as you activate the WooCommerce plugin on your site, you’ll get to see different modules in the customizer page itself. With the help of these modules, you can select alignment, layout, and number of products you want to display on each sales page. The one extra advantage with Astra theme as compared to GeneratePress is that you can use Astra Pro and select the order in which the product information will appear on each page. So, in terms of WooCommerce integration, Astra tops the list followed by GeneratePress and Schema. Those who have used Schema know how quick the support system is. You will get 24×7 premium technical support and regular updates for the next 12 months from the date of purchase. Besides, Schema comes packed with ready-made video tutorials, so that users don’t have to face any technical issue while installing it for the very first time. Same is the case with Astra and GeneratePress. Both of them offer you free support and regular updates for a period of one year. Usually, you won’t face any technical error while using these themes. But if you do, you can simply raise a ticket and get an immediate response from the dedicated support team. Additionally, you can also post your query in their support forum and receive inputs from other experts who have been using these themes for a long time. Based on the quality of technical support and updates, Schema gets the top spot followed by GeneratePress and Astra. Schema, Astra, and GeneratePress are freemium themes, which means you can get their basic versions free of cost. If you wish to design a site that can rule the dot-com world, rank high on search engines and generate a lot of sales, then you can spend few extra bucks and go for their premium versions. The Schema WordPress theme is available for $69. Nonetheless, you can get it for a throwaway price of $19 as part of the current discount offer by MyThemeShop. This price includes all of its premium features, usage rights on up to five domains, support & updates for 12 months, and much more. Schema comes with a 30-day money back policy. Astra Pro, on the other hand, is available for $59 yearly or a one-time payment of $249 for life. If you’re a developer and have got a decent client base, you can opt for its mini agency bundle for $499 and get a host of ready-made starter sites to kickstart your web development projects in style. The agency bundle of Astra Pro is available for a one-time payment of $699. It’s best suited for digital marketing and SEO agencies with large client base. Astra comes with a 14-day money back guarantee. GeneratePress premium is available for a decent price of $39.95 annually, which includes free updates and technical support for up to one year. You can use GeneratePress premium on unlimited sites. If you decide to renew it for another year, you’ll get a flat 40% discount. In terms of price, GeneratePress should come first. But since Schema can be bought for $19 as part of the current discount offer by MTS, it secures the first place followed by GeneratePress and Astra. Schema, GeneratePress, and Astra have loads of features to get your desired results and ensure that your site performs well online. It’s up to you to take a stand and finalize as to which one of them you want to opt for. If you have a tech, healthcare, lifestyle, sports, business, lifestyle or any similar blog that you want to rank on the first page of search engines and ensure that it performs flawlessly on smaller devices, then go for Schema without any doubt. It’s the most appropriate option available in the market for such requirements. However, if you want to design a page builder friendly website that has lots of options for customization without affecting the overall search engine performance, then Astra and GeneratePress should be your top choices. So, pay close heed to all these points and make a call as soon as possible to design a superb website that can keep the competition under the thumb and help you achieve desired results without a hitch. 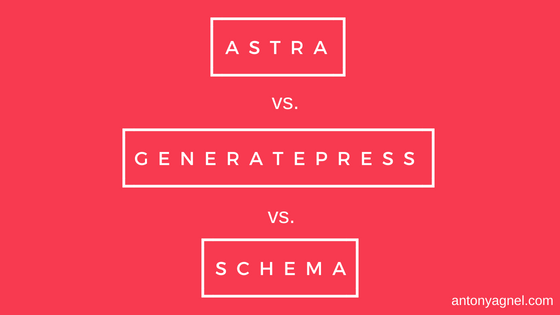 Great comparison between Astra, GeneratePress and Schema. GeneratePress looks promising! Very good comparison, I should really check out MTS Schema!